In 1966, two virologists discovered a new virus from samples collected from an outbreak of fever in Maharashtra. They named it Chandipura virus (CHPV), after the town where they made the discovery. However, much research into the newly discovered virus did not ensue as the CHPV was classified as an ‘orphan virus’—a category for viruses that do not have pathogenic qualities—and was left to scientific obscurity. That changed in 2004, when an encephalitis outbreak in Andhra Pradesh claimed 183 lives, mostly children below the age of 12. The patients reported high-grade fever, occasional vomiting, rigours, sensorium, drowsiness leading to coma and death within 48 hours. India frequently sees such outbreaks of encephalitis and the cause is not always clearly defined. The common culprits are Japanese Encephalitis, dengue, West Nile, measles viruses or chalked down to an unknown pathogen. When scientists analysed the samples collected from this outbreak, they found, to their surprise, that it was the Chandipura virus that was previously thought to be an ‘orphan virus’. This prompted a renewed interest from the scientific community to understand its basic biology and mechanism of infection. The CHPV belongs to family of rhabdovirus, has a single-stranded RNA and five genes. It travels through arthropod vectors like sand flies and mosquitoes. The virus reaches the salivary gland of the insect and is transferred to the mammalian host through bites. Animal studies showed that the virus affects only neurons and causes neurodegeneration. Anirban Basu’s group from the National Brain Research Centre (NBRC) in Manesar have been studying the brain’s immune response to viral pathogens for years. They got interested in the Chandipura virus. In 2013, their studies showed that the neurons infected with Chandipura viruses are killed by a particular mechanism of programmed cell death. More recently, they published results that shed light on the trigger for this neuronal death. In CHPV-infected mice, they found that although CHPV infects neurons in the brain uniformly, neuronal death was biased towards certain regions like the cortex and hippocampus and to a lesser extent in the thalamus and striatum. These areas correlated with high level of microglial activation. Microglia are the primary immune cells of the brain and are activated in response to infection and release molecules like pro-inflammatory cytokines, chemokines, reactive oxygen species (ROS) and nitrogen species. 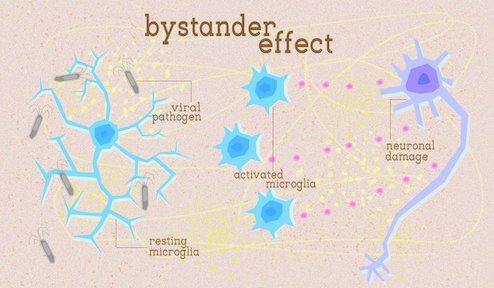 However, chronic microglial activation and sustained levels of these secreted molecules result in increased neuronal death in the vicinity, which is called the “bystander effect”. They also found increased expression of certain signaling proteins, which are markers of inflammation, and molecules, which are indicators of higher levels of reactive oxygen and nitrogen species. The spatial distribution of these molecules also corresponded to the regions where the neurodegeneration was high. This suggested that microglial activation was causing damage to the brain after CHPV infection. Subsequently, the researchers confirmed that molecules released by microglial activation alone caused neurons to die. They did that by first infecting a cell line with CHPV virus, which caused the microglia to be activated. Then, they extracted the chemicals released by this microglial activation and used it to infect a normal neuronal cell line. This caused the neuronal cell line to die, showing that molecules released by activated microglia alone can cause cell death in neurons. Although there are increased efforts to understand the molecular and cellular mechanisms of CHPV infection, there are doubts whether CHPV alone can explain the observed symptoms, and whether the mortality is due to encephalitis or a vascular stroke. Encephalitis caused by different viruses have similar symptoms and genetic and immunological data can be misleading, but only more research can help unravel this deadly mystery.